For CB radios, the longer the antenna, the better its results. Your dealer will be able to help you with your choice of antenna. Must be fixed to the vehicle where there is a maximum of metallic surface (ground plane), away from windscreen mountings. If you already have a radio-telephone antenna installed, the CB antenna should be higher than this. There are two types of antenna: pre-regulated which should be used on a good ground plane (e.g. 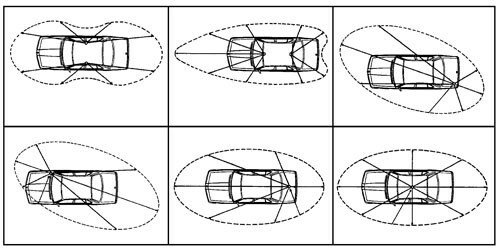 car roof or lid of the boot), and adjustable which offer a much larger range and can be used on a smaller ground plane (voir Adjustment of SWR). For an antenna which must be fixed by drilling, you will need a good contact between the antenna and the ground plane. To obtain this, you should lightly scratch the surface where the screw and tightening star are to be placed. Be careful not to pinch or flatten the coaxial cable (as this runs the risk of break down and/or short circuiting). A fixed antenna should be installed in a clear a space as possible. If it is fixed to a mast, it will perhaps be necessary to stay it, according to the laws in force (you should seek professional advice). All PRESIDENT antennas and accessories are designed to give maximum efficiency to each CB radio within the range.